If you're getting your personal aircraft ready for flight after a long winter in the hangar, then you might already have a few destinations in mind. But if you're looking for somewhere new to go, consider these four great summer fly-in destinations that the whole family can enjoy. Gillespie County Airport might be the perfect destination for a summer weekend getaway. With plenty to do in the area, you can bring the whole family. Pilot Info: Located in the middle of Texas, T82 is an easy-in/easy-out airport. Gillespie County Airport has a 5000-foot runway, and the terminal, phone, and restrooms are attended 24 hours per day. Fuel by truck or self-serve is also available at all times, and an aircraft mechanic is on site. 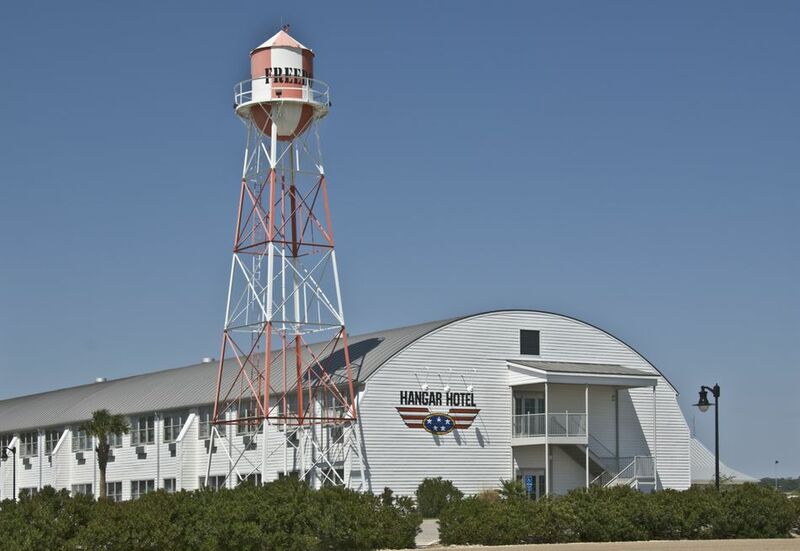 Where to Stay: This one's easy: Stay in the 1940s-inspired Hangar Hotel, which has a beautiful lounge and bar area, and enjoy a "Bomber Burger" and a chocolate malt from the adjacent Airport Diner. What to Do: Take a taxi into town for some great German food, antique shopping, and a visit to one of the breweries or wineries. Browse the boutique shops and sample local foods. Take a wine tour at the Fredericksburg Winery, named one of the top 3 wineries in Texas by USA Today. Stop at Wildseed Farms to see fields upon fields of wildflowers and butterflies. Or walk through the Fredericksburg Trade Days on the 3rd Saturday of the month to find antiques, collectibles, hunting and fishing equipment and lots more. Who can pass up mountain views and wildlife sightings? Yellowstone anyone? If you are looking for a pilot-friendly summer vacation, Yellowstone Airport has it. Pilot Info: Yellowstone Airport sits at 6644 feet in a 15-mile wide valley just west of Yellowstone National Park, and is only staffed from June to September. Inexperienced pilots should exercise caution because of the surrounding mountains, but shouldn't have any problem getting in and out with a little planning. Fellow pilots have added many positive reviews of the airport's FBO on Airnav.com. Tie-down fees are $5.00/night for single-engine piston aircraft, and higher for larger planes. Where to Stay: If you're not opposed to camping, the best place to stay is at the adjacent pilot-only free campground! (If you can fit the camping gear in the plane, that is. )If you're opposed to camping, you might consider one of the hotels in Yellowstone National Park, or you can look for something less pricey in West Yellowstone. There is no shortage of things to do in the area for the outdoor enthusiast. Swimming, hiking, camping, fishing and horseback riding are all nearby. The airport even offers free bicycles for pilots to use while in the area. Sedona's airport prides itself on being "America's Most Scenic Airport," and rightly so: The airport is located in the middle of stunning red rock canyons. For a truly authentic southwest experience, Sedona is the place to land. Pilot Info: Sedona's runway is just over 5000 feet and sits right atop a plateau in the middle of "Red Rock Country" in central Arizona. It's terminal and FBO are only attended during the day, 7 days per week. The Mesa Grill at Sedona Airport isn't your typical airport restaurant. It's modern and upscale, with grand architecture, a full bar, and fine dining. Bonus: Military and uniformed pilots get a discount! Where to Stay: The Sky Ranch Lodge is within walking distance from the airport, but Sedona offers the typical budget and luxury accommodations found in every tourist area, along with a number of Bed & Breakfasts. What to Do: You don't need to go far — Airport Mesa (where the airport is located) offers some of the best views in the area! If you have time, though, the city of Sedona offers upscale shopping and dining in a quaint, small-town atmosphere. Local artists and musicians can be found at the multitude of shops and venues in downtown Sedona. You can take a Jeep tour, hike the red rocks or take a short drive to Jerome, an old mining town popular for its ghost stories. Colorado is known for its mountains and outdoor activities, which Boulder definitely provides. Boulder Municipal Airport is also known for its annual summer fly-in and swanky WWII-style 1940s themed ball. Pilot Info: Boulder Municipal Airport is an uncontrolled field sitting at an elevation of 5,288 feet. It's attended during the day and its longest runway is 4,100 feet long. Twenty-four-hour self-serve fuel is available. Pilots are cautioned to check density altitude. Unfortunately, there are no instrument procedures here, so plan accordingly. General aviation pilots are served by Journeys Aviation, which charges $8/night for tie-down. Maintenance, hangar space, and engine warm-ups are available. Where to Stay: Residence Inn and Courtyard by Marriott are both near the airport, but the city hosts tons of hotels, motels, and lodges. Or, if you want to get away from the city, there are multiple places to camp in National Forest areas above Boulder. What to Do: Outdoor enthusiasts can go wild in Boulder with rock climbing, hiking, biking, camping, and fishing. Tours and excursions are available for those who want someone else to do the organizing. But there's plenty for the non-outdoors types, as well. The city has everything — museums, performing arts, open-air shopping, nightlife, parks and playgrounds, wineries and breweries. What else can you ask for?